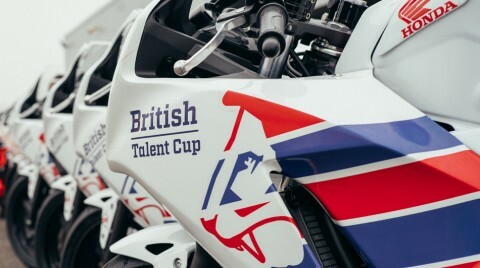 The all-new British Talent Cup began in 2018, putting in motion a whole new phase of Dorna’s Road to MotoGP™ program. The Cup is designed as the perfect stepping-stone for riders from the British Isles to get onto the world stage, providing an opportunity like no other for young talent to grow and progress on the Road to MotoGP™. 23 riders lined up in the first season to fight for the title of first ever British Talent Cup Champion and another grid do battle in 2019. The riders in the BTC, aged between 12 and 17, are all handpicked from aspiring hopefuls at the British Talent Cup selection events ahead of the British Grand Prix at Silverstone. Racing on Honda NSF250R Moto3™ machinery, the calendar begins alongside the British Superbike Championship (BSB) at Silverstone and then heads to Donington Park to race on the national circuit with BSB. After that it’s time for them to saddle up with WorldSBK at Donington before getting a taste of Snetterton alongside BSB once again. For the penultimate round it’s off to different shores as they race at Brno alongside MotoGP™ in August, and that sets up the season finale to perfection as the British Grand Prix at Silverstone hosts the last two races – rounding out a perfect mix of tracks and events in an exciting and challenging year of competition. Who will take the second ever British Talent Cup? Six events, 12 races and another grid of young talent are ready for the challenge in 2019. The British Talent Cup is run by Dorna, the organisers of the MotoGP™ World Championship and the MOTUL FIM Superbike World Championship, as well as coorganiser of the Red Bull MotoGP Rookies Cup. The competition is intended to discover the most talented young riders in the British Isles, providing the first step on their Road to MotoGP™. The organisation provides all-encompassing support to riders with a full, professional infrastructure meeting international racing standards, as well as also managing all the logistics involved in running the Cup. Beyond nurturing their talent, the support provided to the riders also includes some of the travel costs incurred so they can focus on the job at hand: developing their potential as motorcycle racers. Sister series the Idemitsu Asia Talent Cup has already proven to be a resounding success when you look at the entry list for the 2019 World Championship, and the British Talent Cup is the next exciting addition to the Road to MotoGP™ program. As 2018 competitor Max Cook moves into the Junior Talent Team in the FIM CEV Repsol Moto3™ Junior World Championship on the Road to MotoGP™, the 23-strong mix of veterans and rookies in the British Talent Cup fight to follow in his footsteps this season.